Cervical myelopathy is one of the most common causes of neural disability in the older population. The symptoms of this condition usually develop slowly over a long period of time and often people have been experiencing symptoms for some time before they come to be diagnosed. The symptoms of cervical myelopathy can mimic a number of other disorders so it is important that the condition is investigated fully and carefully by a physician. Cervical myelopathy is caused by a condition called cervical spinal stenosis. Spinal stenosis occurs when the spinal cord in the neck becomes compressed, which is usually due to degenerative changes. As you age, the discs between your vertebrae start to dry out and may bulge or herniate. At the same time, the shape of your vertebra may change due to arthritis, causing spur-like protrusions. 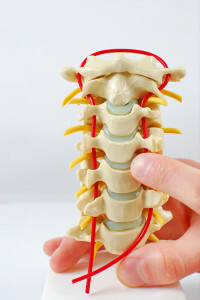 The ligaments linking your vertebrae also may thicken. It is a combination of these factors that usually lead to a narrowing of the spinal canal in the neck, and eventually to pressure on the spinal cord. The symptoms of cervical myelopathy usually develop over a very long period of time, leading to a delay in being diagnosed as some people with this condition mistakenly believe the symptoms to be just ‘old age’. To confirm the diagnosis, your doctor may send you for tests which may include a MRI scan and/or CT and possibly an electrical study (SSEP) that measures the effectiveness of the signal along the nerve pathways between your limbs and brain. There is some controversy regarding the best way to approach treatment of this condition. Some research has suggested that immobilization of the neck (by using a neck brace) can be effective for some people. Physical therapy may also be of benefit, particularly in the beginning to middle stages of the condition. For a small group of people with this condition, surgery is necessary to take the pressure off the spinal cord. This is particularly true for people with a lot of signs and symptoms indicating that the nerves and spinal cord are being compressed. There are a number of surgical approaches for this condition and your doctor will discuss with you the best approach for you. Surgery will probably be followed by a period of rehabilitation to ensure that you regain as much mobility as possible and to help you resume your normal life.